World Fine Art Professionals and their Key-Pieces, 207 – Kees van Dongen | Marbella Marbella – Adelante! Kees van Dongen, raised in Delfshaven, made his name in the interbellum in Paris. He became one of the most important artists over there. Especially his way of life was controversial. The flamboyant parties in his studio continued into the night and were visited by renowned politicians, artists, writers and film stars. This exuberant atmosphere is reflected in his performance: elegant lines, striking colors and special women. 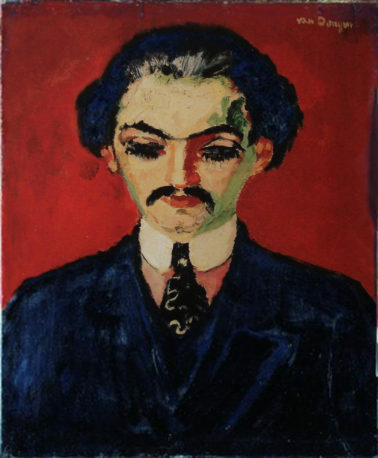 He was one of the most important Dutch representatives of fauvism. Van Dongen spent his childhood in Rotterdam. His drawing talent was discovered early on, but there was no money for him to study. He had to earn a living from the age of fourteen. In 1895 he traveled to America as a steward. In the meantime he took evening classes from 1892 to 1897 at the Rotterdam Academy of Visual Arts and Technical Sciences – the present-day Willem de Kooning Academy, but he did not like it. Attracted by the bohemian life, he walked away from home and moved into a room in Rotterdam above the studio of the painter Martinus Schildt. Singer and poet Koos Speenhoff, who also ran away from home, lived there. In 1897 Van Dongen left for Paris, where he ended up in Montmartre. There he came in contact with Max Jacob, Juan Gris, and Pablo Picasso. He provided an income for himself as a house painter and as an illustrator for satirical magazines such as L’Assiette au Beurre and Gil Blas. Between 1898 and 1899 he returned temporarily to Rotterdam in a studio at the Batavierenstraat. After this he settled in Paris for good. On 11 June 1901 he married Augusta Preitinger, whom he knew from the Rotterdam Academy. They had one daughter. In 1906 the young family moved to the “Bateau-Lavoir” on Rue Ravignan 13, now Place Emile-Goudeau. There was also Pablo Picasso, then with his girlfriend Fernande Olivier. 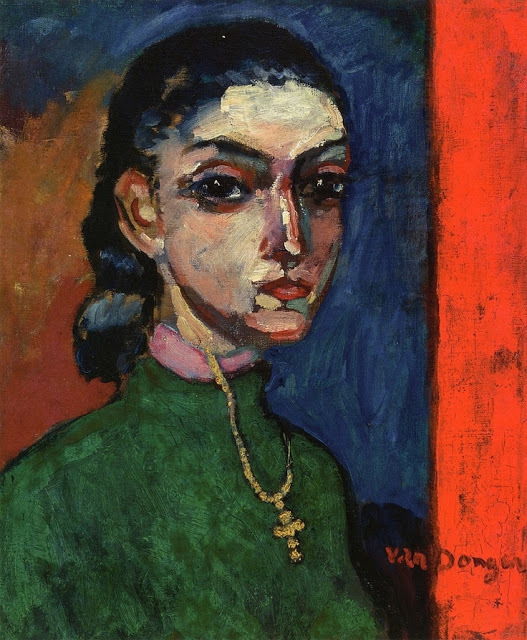 Van Dongen paints a portrait of her. He mainly earns a living by selling newspapers and acting as a wrestler. His compassion brought him into contact with anarchist environments. He meets the writer Felix Feneon, with whom he immediately makes a deep and lasting friendship. As an admirer of George Breitner’s city impressions, he had already made a self-portrait in 1895 in large and yellow areas of color where he casually leans against a window. That portrait, now on display at Center Pompidou, was ahead of later Fauvism. Just like Picasso, Van Dongen regularly visits the famous places of entertainment of the neighborhood. He often goes to Medrano and paints the circus artists there with great interest. A favorite subject is the environment of prostitutes and courtesans. It becomes his central theme. He paints many female nudes. To him, the woman was ‘the most beautiful landscape’. Eventually he gets success, also through his good commercial contacts with prominent art dealers such as Druet, Ambroise Vollard, D.H. Kahnweiler and G. Bernheim Jeune. 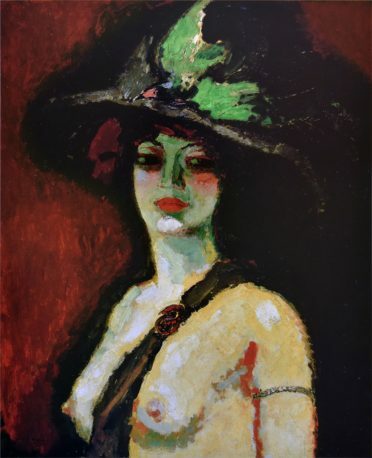 In 1905 Van Dongen caused a sensation at the Salon d’Automne in the Grand Palais in Paris. 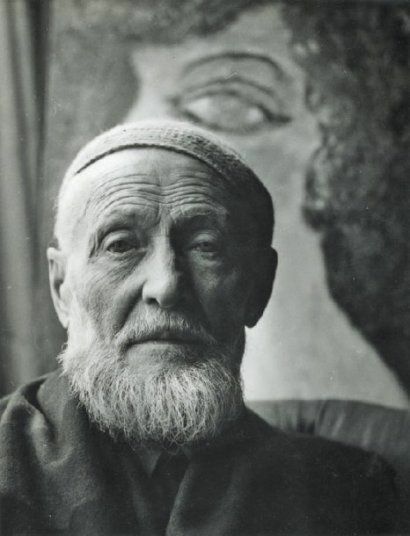 Here he exhibits with artists such as Henri Matisse, Albert Marquet, Andre Derain and Maurice de Vlaeminck. His Women’s Portraits hang there: in bright, unmixed colors, with large black-rimmed eyes and a bright red mouth, no longer faithfully rendered and without perspective. A French critic called these painters Fauves (wild animals). Since 1905 this became the name for the representatives of French expressionism with paintings of people and nature in bright colors, such as red, yellow, blue, green, purple and black, applied in large areas, almost without perspective. 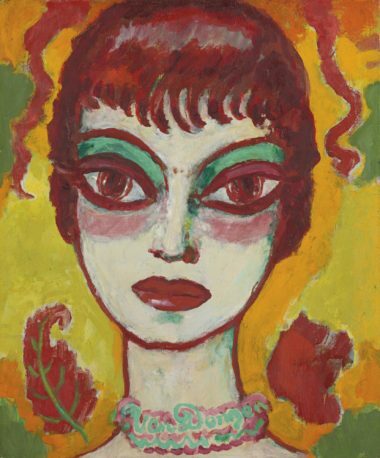 Each painter followed his own preferences in color and shape. 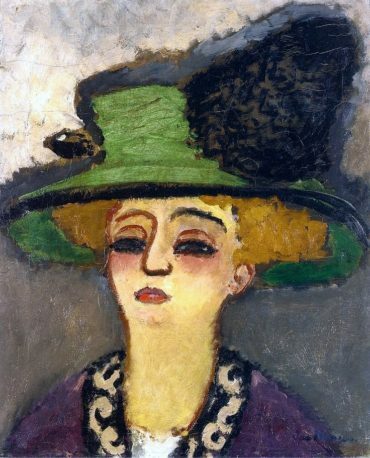 Van Dongen, one of the pioneers of Fauvism, opted for green nose shadow and vast eyes. Between 1900 and 1907 he came to the Netherlands a lot to paint bright-colored landscapes and to find a market for his work. 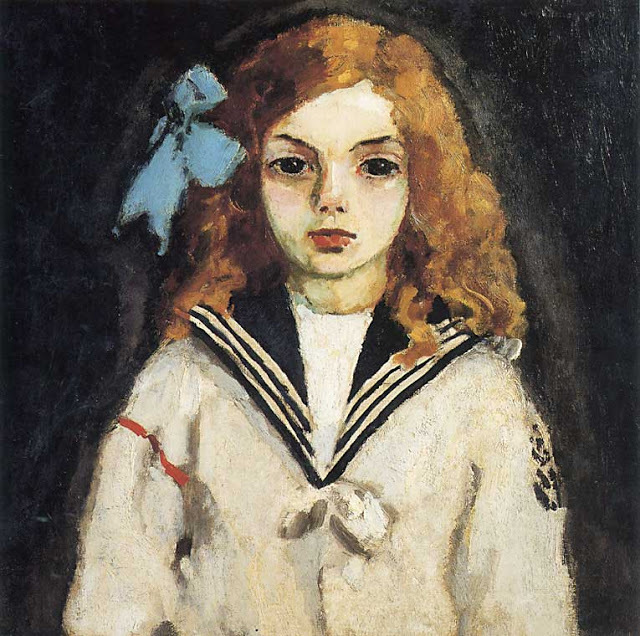 In 1907 and 1911 he exhibited at the St. Lucas Association in the Stedelijk Museum in Amsterdam, but Paris remained his home town and source. 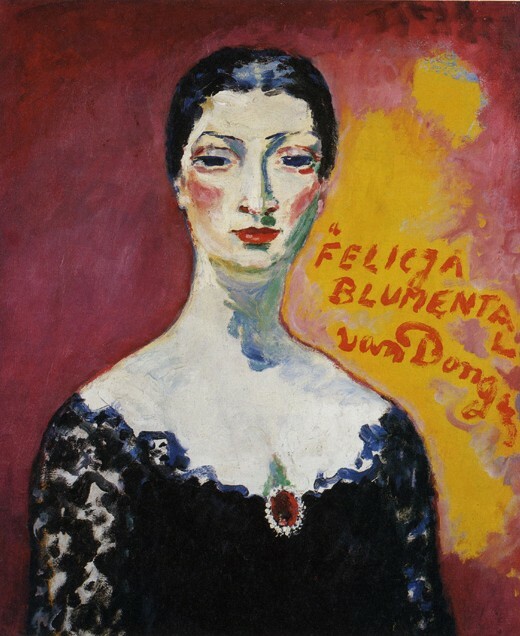 In 1908 Van Dongen became a member of the German expressionist artists’ association Die Brücke in Dresden, one of the painters of the group, Ernst Ludwig Kirchner, was impressed and took over elements from him. Meanwhile, Van Dongen became a celebrated artist in Paris. After a few trips in 1910 to Italy, Spain and Morocco, he lived at Montparnasse since 1912, where he held parties for the Parisian beau monde, including fashion king Paul Poiret and painter Matisse. After the First World War his work became more realistic. However, his interest in feminine beauty stayed and remained a regularly recurring theme. Thanks to the contact with the Marquis Casati, he became the portrait painter of the fashionable circles after 1921. In this portraiture, he appeared to be influenced by the reliefs he had seen in Egypt in 1913: the woman’s type of the ‘garçonne’ is indicated in strong lines by her slender elegance and vast eyes. In the same vein, he painted the vedettes of the Folies-Bergère with their feathers and beautiful jewels and – inspired by the painter Raoul Dufy – the gondola festivals in Venice, the beach life of Deauville and the Riviera. 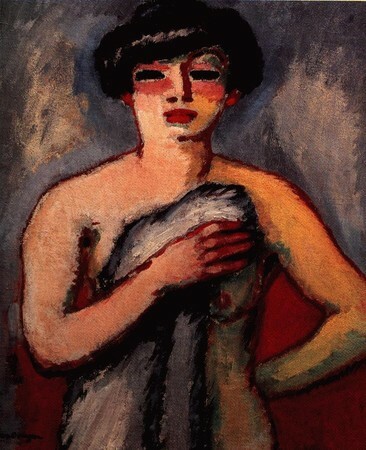 In 1926 Van Dongen obtained the French Legion of Honor and in 1929 he became a French citizen. Two of his works were shown in the Palais du Luxembourg. After the liberation of France in 1944, Van Dongen remained a well-known painter in Paris, who was active until a very old age: a keen observer and fierce enjoyer of life, the ‘reporter’ of the outgoing world. 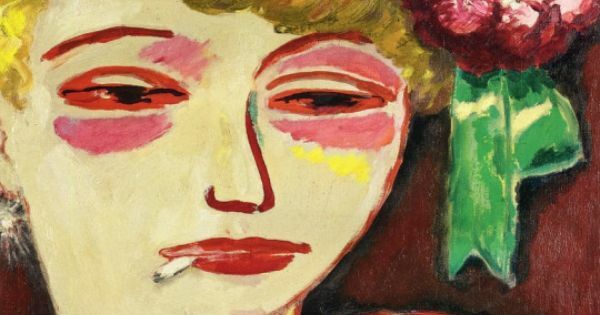 In tradition and style, his name was inextricably linked to fauvism, even after the Second World War. As a portraitist, he was one of the most important representatives of this art movement. He continued to make illustrations for books, including La révolte des anges by Anatole France in 1951 and Les fleurs du mal by Charles Baudelaire in 1963. After his divorce he married Marie-Claire Huguen in 1953. A son was born from this marriage. Van Dongen moved to the French south coast at an advanced age and died in 1968 at the age of 91 in Monte Carlo. His work continued to do well on the international market. In February 2008 the canvas Ouled Naïl was sold at a record price of 7.5 million euros at Christie’s in London. La Gitane raised more than 8 million euros on 1 February 2010 at an auction at Christie’s in London.